We are a voluntary effort of more than 100 committed highly qualified and trained facilitators who are keen on ensuring social justice. Combinedly we represent more than 600 man-years of experience of working with the poor and downtrodden. With resources persons who have rich experience in the field we are functionally divided into separate departments to deal with the different requirements of the underprivileged we assist. 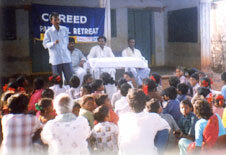 In fact many of our resource persons have received their basic training at COREED and have returned to work with us to contribute their mite towards development of their fellow humans from the same community and villages who are crushed under the twin devils of castiesm and poverty..
Department of Education: This department deals with the educational requirements of the underprivileged. 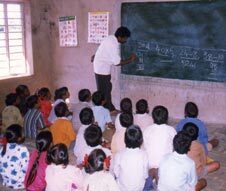 We have 30 Free Rural Study Centers in Nellore and Prakasam districts, benefiting more than 2300 students every year. These centers during the summer vacation double up as Free Summer Tutorial Institutes imparting training in Mathematics, Science and English, which are considered difficult subjects, especially for rural poor. We provide free coaching for polytechnic entrance examination, apart from helping students cope with the studies and prepare for government examinations for VII and X grade. Every year we have been enabling 250 students prepare for entrance to Government Residential Schools. Department of Technical Education: The George Technical Institute was established in the year 1995 with the inspiration of Dr George Vischer, Switzerland. We thank Basel Stadt and the Church in this regard.This Department of Technical Education has successfully provided vocational technical training to 721 students and awarded them certificates. Every year 120 students join this institute. 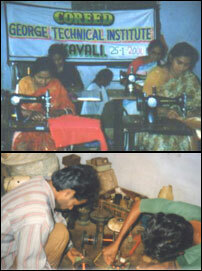 This department enables the underprivileged find livelihood with appropriate technical training. The scope and reach of the training programmes are being expanded to reach the womenfolk in interior villages. Thereby enabling them to free themselves from the clutches of poverty and take up sustainable economic activity. Department of Health Services: This wing ensures basic health requirement of the villagers by conducting health and hygiene awareness camps and also operating mobile health camps. This department provides mobile health service with a team of four doctors and two nurses. The main objective of this department is to reduce the infant mortality, which stands at 66 per 1000 and to enable the poor to earn their livelihood. The major problems faced by the patients are maternity issues, cancer, tuberculosis, amoebiasis, typhoid, and malaria apart from respiratory diseases in children. 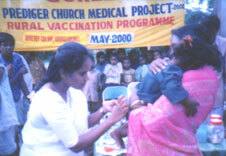 AIDS is another major concern in these villages. We have a voluntary team of qualified specialists in pediatrics, gynecology, general medicine and ophthalmology disciplines, who tour the interior villages with periodic regularity providing access to quality healthcare to the unreached Dalits and Adivasis. Department of Women Services: This department enables women to liberate themselves economically and encourages formation of women Self-Help Thrift Groups (SHGs). The group formation has empowered the rural women to address social issues like alcoholism and household violence. The groups have succeeded in reducing the incidences of household violence and also discouraged alcoholism and other vices like gambling. The women have successfully started micro-enterprises. We have set up constructed Women Development Centers in some villages and intend to set up similar centers in all the villages, which will help train, these underprivileged women and enable them to take up sustainable income generating activity. These centers would enable members of women self-help groups learn vocational trade and improve their existing skills. These centers would also be the focal point of women empowerment. formed with emphasis on thrift and credit activities. “Rupee a day” slogan is used to inculcate thrift habit among under-privileged and resource challenged. 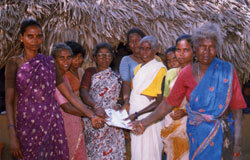 The SHGs mobilise petty savings, which is recycled as loan among the members of the group. Rotation is need-based and priorities are decided by group members. There are -regular , weekly, fortnightly or monthly- meetings. Groups are trained to maintain accounts to ensure transparency, collective decision-making and democratic working. This has enabled women to become aware of their rights and become more responsible citizens. Articulate needs. Awareness - building. Ability to fulfill their felt needs. Act as pressure group. Become partners in decision-making. Gain respectability. Department of Public Relations: With emphasis on increasing awareness among the rural unreached, We have been conducting workshops, awareness seminars, parental retreats, training programmes for rural teachers and volunteers, talent search and cultural programmes in the field. This department has the onerous responsibility of empowering the underprivileged with knowledge of their own needs and means to address them. This wing is responsible for the interaction with various external agencies and organisations in the field and who share synergies with us. This department has volunteers from among the underprivileged who initiate action addressing their problems. We have successfully facilitated the process of enabling the underprivileged to seek their solutions. Our monthly parental retreats have enabled the parents interact with community and teachers and other educational volunteers thereby keeping track of progress of their wards as well as appreciate their own contribution to improvement of society. To ensure consistent quality of training programmes we conduct regular refresher courses for our volunteers in the field. This enables them to learn the latest in their subject as much as reiterate their commitment. We have officials from the State Education Department and organisations. We have also other experts as resource persons for the refresher courses. Our Dalit and Tribal Welfare Cell in this department has helped the underprivileged sections of rural South India to voice their concerns and get what is rightfully theirs. This cell helps the community to identify its needs and liaisons with the different State agencies. Department of Environmental Issues: This department delivers the message of sustainable development and educates the rural poor about the need for environmental protection. We have started enlightening the people about the importance of green earth and water conservation. This enables to store the water in the wells during the summer. 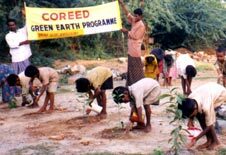 We also encourage the children and the villagers to plant saplings to protect the earth and to provide healthy environment.